At Ricky Evans Gallery we now offer high quality Art and Photo Restoration. We have partnered with Strazza Art Restoration to offer this much needed service. The owners, John and Lisa Strazza, are both local artists and highly experienced art and photo restorers. Lisa Strazza is also on staff here at Ricky Evans Gallery, Monday – Wednesday. If you have an oil or acrylic painting that has chipping, flaking, looks grimy or dirty, is smoke damage, or has been ripped or torn, then we can help. 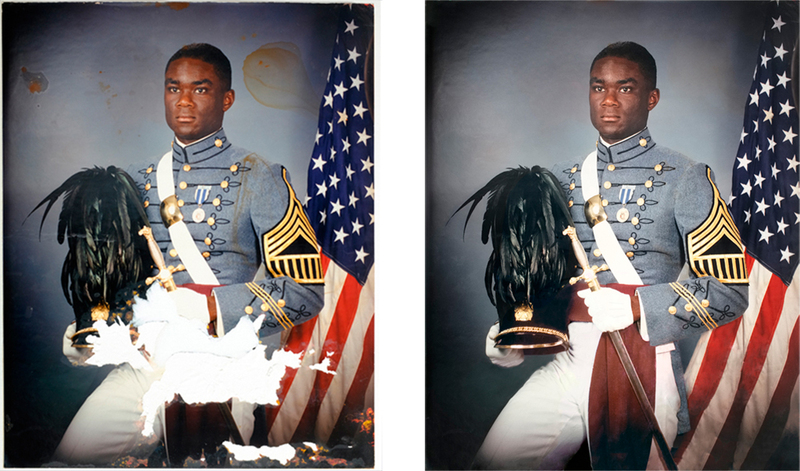 If you have a photograph that has faded, ripped, torn, or damaged in any way, we can help. Just bring your art or photos to Ricky Evans Gallery so we can take care of your restoration needs. 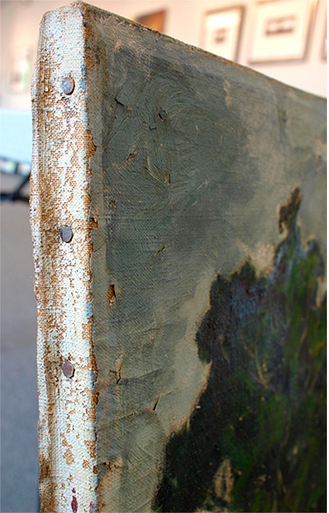 Below: Detail of the painting above showing severe flaking and other problems.